I meant to write this a few weeks ago, but have been struggling under the weight of grant writing. Though, when it comes down to it, one of the grants I contributed to is for the coolest thing; if it gets funded i’ll tell you about it. Anyway, a few weeks ago a paper was published on one my favourite groups of extinct animals. If you are not interested in a story about how one of the oldest and oddest animals we know evolved into a pre-mammalian whale, including undersea slips and the origins of modern animals, look away now. You can’t can you? Once upon a time, in a sunlit sea, a cliff collapsed. This was about 508 million years ago, and this kind of thing had been happening to this cliff on and off for a while. But this time the cliff took with it the animals living on the top, and smashed them flat, and dead, at the bottom. Some millions of years later, this cliff was lifted from the sea floor, and found itself in the Canadian rockies, and the rock formed from the slip, now a shale, began to weather out, splitting to reveal the dead fossil bodies of the animals that lived all those years ago. I have written a bit about these fossils before, they are called the ‘Burgess Shale’ fauna, and they include soft-body fossils from a critical stage of animal life, the Cambrian Explosion. This evolutionary event appears to be when modern metazoan animals appeared, and the Burgess Shale captures the forms of those animals just as they evolved. The description of these fossils was carried out first by a man named Charles Walcott, who discovered remarkable things in the early 1900s. It was re-described and re-interpreted by Harry Whittington, Derek Briggs and Simon Conway Morris in the 1970s and 1980’s. They found lots of new and exciting things that you must read about in either Stephen Jay Gould’s ‘Wonderful Life’, or Simon Conway-Morris’ ‘The Crucible of Creation’, or better yet, both. But one neat thing Whittington and Briggs found was that three fossils that Walcott has described turned out to belong to one remarkable animal; one unlike anything on earth today. To celebrate this new sort of animal, they named it Anomolocaris (Abnormal Shrimp). Here’s a fossil and a model of one. 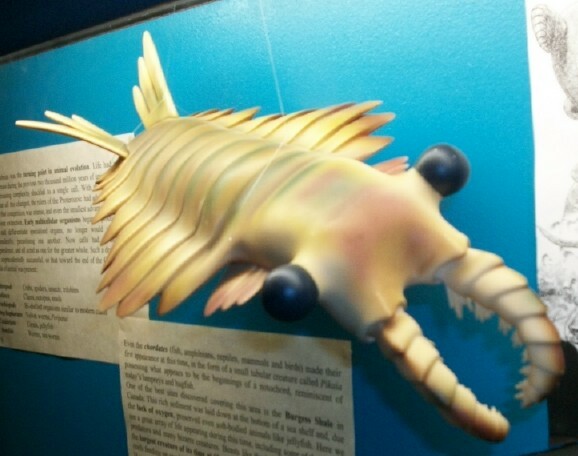 “ROM-BurgessShale-CompleteAnomalocarisFossil” by Keith Schengili-Roberts – Own Work (photo). Licensed under CC BY-SA 3.0 via Wikimedia Commons. Model from Dinosaur Museum, Canberra, Australia. Weird huh? Even more amazing, this thing grew to a few feet long, which is a giant in Cambrian animals. It had big eyes, a fast propulsion system, grasping claws out the front, and a bitey mouth; this was a fast moving 2 foot-long predator. It also turns out to be an Arthropod, related to spiders, shrimps and insects. A giant, fast moving, predatory shrimp. You can see an average animation of one, and other Burgess Shale animals here. Wait for him! 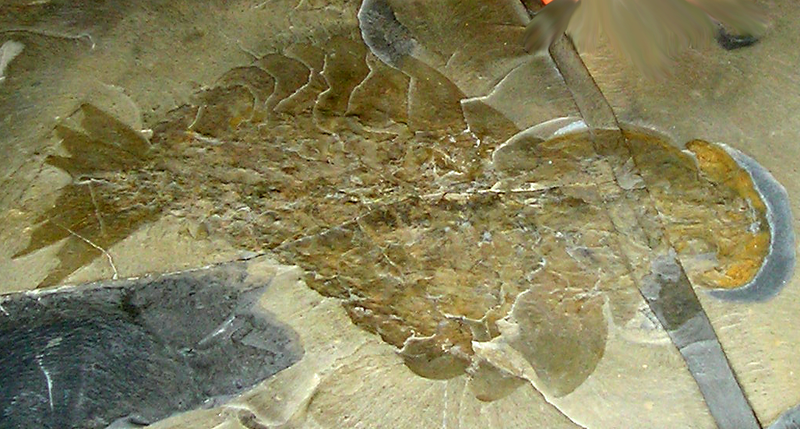 Anomolacarids have been found as fossils around the world, and now have been discovered, by Derek Briggs, to have survived the Cambrian, and been alive in Ordovician times (485-443 million years ago), including giant specimen a full metre long. A few weeks ago, however, that was beaten by the discovery, also by Derek Briggs, of a 2.1 metre Anomolacarid, from 480 Million years ago, named Aegirocassis benmoulae. This huge beast, one of the largest Arthropods that has ever lived, had modified appendages that had evolved into a filter feeding structure. You can see a reconstruction of it here. Remarkably, it seems that some of the descendants of the arthropod ‘killer whale’ of the Cambrian evolved into huge filter feeders, paralleling the giant baleen whales of our oceans. So why should we care? Well, to begin with, Hamlet had it right with “there are more things in heaven and earth…” which is, to me a joyful thought. But it also tells us that the forms and behaviours of organisms are shaped by opportunity. The opportunity to collect plankton drove the evolution of both whales and Anomolacarids in a similar way; modified mouth-parts for filter feeding and huge bodies. Similar ways of living drive similarities in form in even the most different of animals. I say up with giant filter-feeding lobsters!